We reuse ‘found items’ on the farm wherever we can. Furnishings are handmade on the farm using recycled or farm produced materials, or bought locally wherever possible. We provide separate bins for recycling and composting waste and give guests a clear idea of what materials can be recycled. Food waste is collected in a separate, clearly labelled bin in the washing up area and is composted wherever possible. Guests are given the opportunity to offer unwanted food items to others. Unused packaged food items are taken to our local food bank. We reduce the amount of energy that we use on site by using the heat created by the rocket stove to heat kettles of water at the same time as it is heating shower water. Also, by dimming solar lighting and using timer switches to regulate the times that lighting can be switched on. We reduce the amount of paper that we use by concentrating bookings through our online system. We use recycled paper for admin and for media printing. We use paper packaging that can be recycled for our food parcels and our alpaca products. Wood is sourced from around the farm or bought locally. Eco firelighters are provided onsite for free and are made without using chemicals from wood shavings and wax. Our charcoal is made locally in Suffolk. The campsite composting loos collect human waste, which is then composted and put back into the earth around trees and hedges around the farm. All of the water used on site is recycled using GROW, a system that uses gravel and marginal plants to convert Grey water to Green water. The Green water is then released back into the environment. The composting loos save water as they do not need to be flushed. Rain water is collected from the buildings on the campsite and is used to water plants and dilute the collected urine from the toilets and urinal. All of the energy need for water heating, space heating, lighting and cooking on site is produced using wood or solar power. Rechargeable batteries are used wherever possible. Our washing machine and tumble drier have the highest energy rating possible. Large areas of the meadow are left undisturbed for wildlife. Pitches and paths are cut into the meadow to encourage guests to use specific routes. Dead hedges and native hedges are used as boundary fencing. We have an area with a bug hotel and snake hotel to give smaller wildlife a home. There is a library of wildlife spotter books, binoculars and bug hunting kits available to borrow. We use eco cleaning products wherever possible. We also use eco hand wash and washing up liquid. Cotton towels are used, rather than paper towels, or electric hand driers. Guests are encouraged to bring their own linen from home. Linen and towels are line dried wherever possible and we avoid ironing if it is not necessary. Wooden buildings are is treated using an environmentally friendly product. We use eco paints wherever possible. Weed killers are only used to treat injurious weeds where required by law. We shop local for our supplies where we can, or choose UK suppliers that are nearby, or that share our values of sustainable living and caring for the environment. 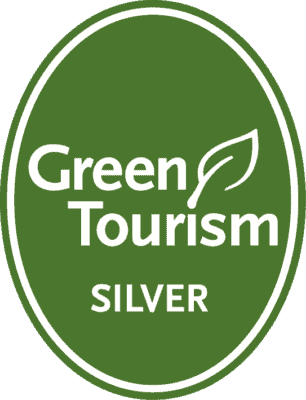 We work with Green Tourism to makes improvements to our green business and reduce our carbon footprint. We are members of Sustainable Bury and have taken an active part in the Bury St Edmunds Green Fair.